Background: For about 30 years Human Immunodeficiency Virus (HIV) has been a significant social and health issue. It has been a perilous opponent in the human contest against HIV. At the end of 2015 there were 26.7 million people worldwide who were affected by the Human Immunodeficiency Virus (HIV) and this number is expected to increase. Unfortunately, currently there are no vaccines available for prevention and control of HIV. The global burden of HIV articulates the need for anti-HIV therapeutic factors. Venom toxins are commonly prescribed for treatment of various medical disorders. Honey Bee venom has recently been proven to be safe and maybe therapeutic in a specified dose. This therapeutic effect is due to the uptake of melittin by HIV infected cells which leads to decreased HIV gene expression and replication. Similarly, Scorpion venom acts as a therapeutic agent against HIV. Snake venoms have antiviral activity against defense mechanisms of viruses. Conclusion: Antiretroviral therapy is promising in the fight against HIV because it limits viral replication. It has the potential to reduce the passage of HIV-1 and to limit the viral load in infected people. 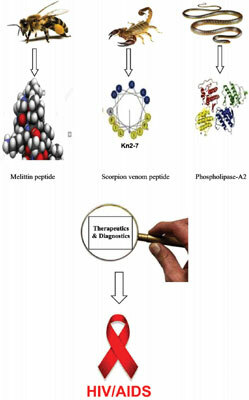 This review aims to shed light on an infectious potential of active constituents of bee, scorpion and snake venom articulated in many recent studies. HIV, Venom, toxin, melittin, antimicrobial peptides (AMPs), therapeutic agent.